Rideheight is another set up parameter which is often overlooked. 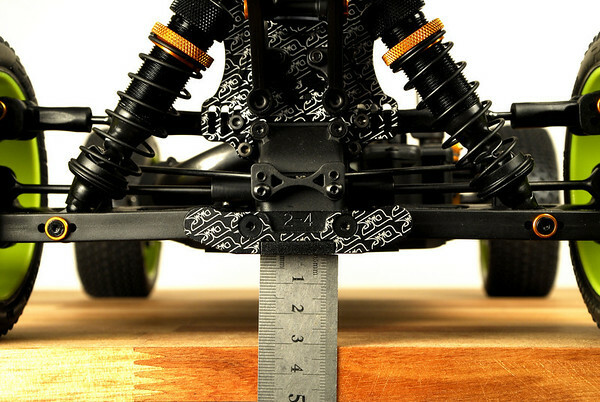 Normally 1:8th buggies are set to have a rideheight between 25-30mm. 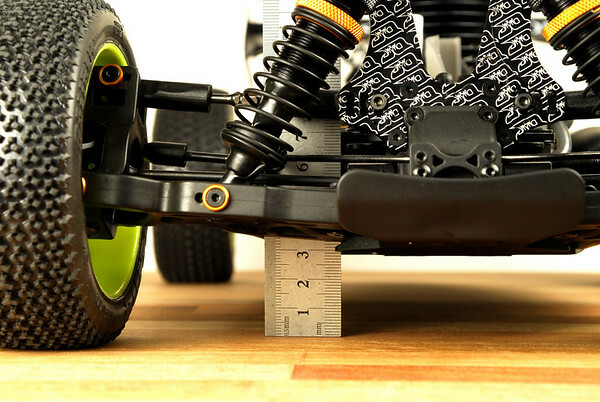 Generally speaking, a lower rideheight will have less traction, and will be less prone to flipping over, and a higher rideheight will have more traction, but the car may flip over easier. A low car is better on smooth, fast tracks, and a higher one better on tracks with many jumps, or a bumpy track. The difference between the front and rear rideheight is also something to consider. Having a lower front, and higher rear, can give the car more steering, and this is how I usually run my car. Also, the car will run more level, as normally the front is raised abit due to being on power, or from having been on power. A higher front and lower rear will make the car even more stable, as it smooths out the steering. It may also make the car handle bumps and jumps better and more consistently. The Front rideheight is measured right behind where the chassis kickup ends. The rear rideheight is measured from the very rear of the car.